Raúl Castro: U.S. And Cuba Can Have 'Civilized Relationship' : The Two-Way For bilateral relations to succeed, said Castro, the countries must learn to respect their differences. Cuba's not changing, he said. And they're demanding that the U.S. change its ways. Cuba's President Raúl Castro speaks during the memorial service of former South African president Nelson Mandela. 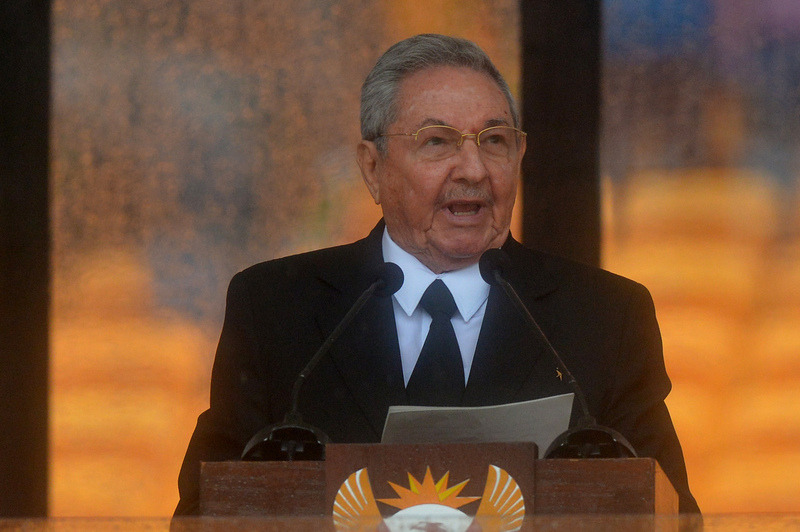 Cuban President Raúl Castro says the U.S. and Cuba could have a "civilized relationship." BBC Mundo reports that in a rare speech, Castro said that over the past year U.S. and Cuban officials have met to talk about immigration and restarting mail service between the two countries. That proves, Castro said, that relations between the two counties could be civilized. "If we truly want to further bilateral relations, we're going to have to respect our mutual differences and learn to live peacefully with them," Castro said. Otherwise, he added, Cuba is ready to continue with the same kind of relationship it's had with the U.S. for 55 years. "We don't demand that the United States change its political and social system, nor will we negotiate with ours," Castro said. Of course, this all comes about two weeks after President Obama and Castro shook hands at Nelson Mandela's memorial service in South Africa. At the time, analysts wondered if the simple gesture would lead to a thawing of relations between the Cold War foes. When that handshake happened, NPR's David Green talked to Dan Restrepo, a senior fellow at the Center for American Progress and former adviser to Obama on Latin America. "... the Cuban people should get to decide Cuba's future. Certainly not the U.S. government and not the Castro brothers. And unfortunately and sadly, Raúl Castro has shown no indication of going along with that part of what change would mean in Cuba." In other words, if you take Restrepo's analysis of the Obama administration's policy toward the U.S. and compare it with what Castro said on Saturday, you're pretty much left with the status quo.